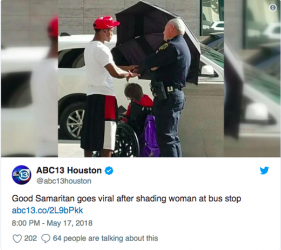 Teen Hero Stops To Cover Wheelchair-Bound Woman In Hot Sun With Umbrella As She Waited For Bus… is the headline. Once again a wonderful example of how we should all take care of one another from this teen hero. This did my heart good, as sometimes people feel that the younger generation is lost.